You are probably accustomed to shopping for women’s fashion and accessories in department stores. As I see it, there are three tiers of department stores in terms of quality, cost and customer service. Higher end stores include Nordstrom and Neiman Marcus, mid level stores include Macy’s and Dillards, and less expensive alternatives include Kohl’s or H&M. Regardless of your preference, department stores tend to be the default option for wardrobe shopping. An alternative is to shop at franchise fashion stores such as Chico’s, White House Black Market or Ann Taylor that all have signature looks at similar mid-point prices. 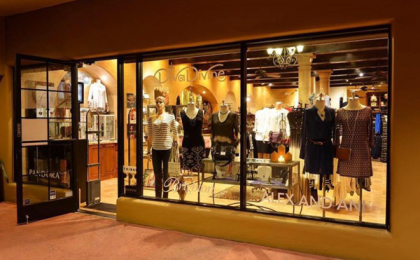 A drawback to many boutiques, however, is their return policy. Department stores and fashion franchises usually give your money back on returns. Whereas the typical boutique return policy is an exchange or store credit, and the return transaction usually needs to be within 7-10 days. Knowing this, when I find an item I love in a boutique, but know it’s available at another type of store, I’ll opt for the later in case a return is needed. So, take your time when you shop, be certain you love what you buy, and enjoy the benefits of boutique shopping. Perfectly outlined! I love short, concise and relevant pieces like this Karen! You’ve got your finger on the pulse of fashion and shopping experiences. Thanks! Well said Karen. You got all the girls in our family hooked on the boutique look … unique, personal and local. Thanks. What an information-rich, thoughtful and beautifully written blog about boutiques. You have a way of capturing the essence of something and making it so relevant to life.